The Books for Walls Project: Get the Scoop! At Your Library: Choose Privacy Week 2012 "Freedom from Surveillance" & "What Parents Should Know About Privacy Online"
Get the Scoop! At Your Library: Choose Privacy Week 2012 "Freedom from Surveillance" & "What Parents Should Know About Privacy Online"
The theme for Choose Privacy Week, May 1-7, 2012, is "Freedom from Surveillance." 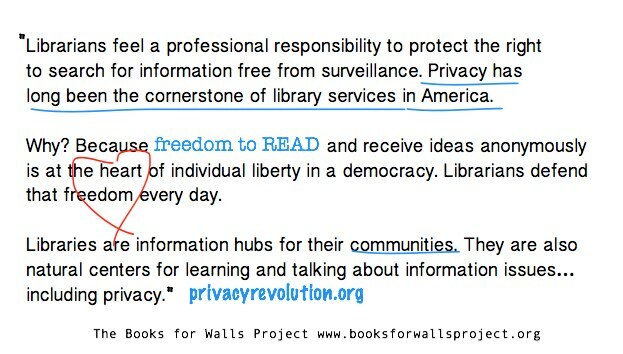 The American Library Association’s (ALA) Office for Intellectual Freedom (OIF) started Choose Privacy Week in 2010 "to deepen public awareness about the serious issue of government surveillance, and offers individuals the resources to think critically and make more informed choices about their privacy." As fast as things change learning about our privacy rights can be a daunting task --what's a person to do? Well, check with the library of course! Or visit privacy revolution.org for resources galore. 1. Do a family privacy audit. 2. Discuss with your children what privacy means— for your family, in school, with friends, and online. 3. Reinforce the message that your children have the right to control what they share about themselves, who they share it with and what others share about them. 4. Take a moment to talk about the “golden rule” of privacy: how to respect other people’s privacy. 5. Remember that sharing online is an opportunity to design a positive digital footprint. Our children grow up with online identities. And remember that once shared, digital media, such as cell phone photos or videos, have the potential to be endlessly shared, regardless of original intentions, and can be virtually impossible to remove. 6. Understand what you’re agreeing to when you or your children share information with commercial interests. Websites that ask for personal information in exchange for use of a “free” or paid product or service, whether it’s a social networking site, online game, store or promotion, often use the collected information in targeted advertising and to shape search results. 7. Get up to speed on social media and privacy and talk about it with your preteens and teens. brought to you by @yourlibrary! The Mom creates "Get the Scoop" to help The Sisters learn about what the library has to offer. Together we gather, review and share the information in hope of shedding a little more light on all the amazing things libraries do for us. the library makes us feel pretty strong!